One of America’s most iconic buildings earned LEED for Existing Buildings yesterday. 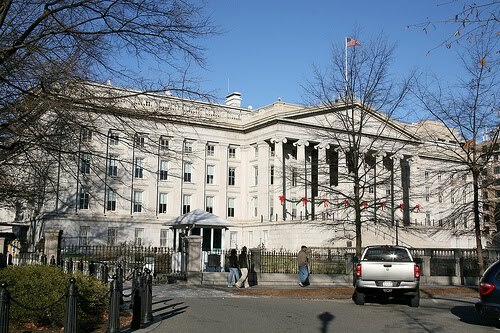 By improving their operations, the Department of Treasury’s headquarters next to the White house has slashed energy, steam and water consumption to save taxpayers $3.5 million per year. The oldest LEED building ever certified also increased their office density by 164 units, which equals big savings in avoided new office space. This is a moment to step back and applaud what has been done. Because the project certified under Existing Buildings, the certification was based on actual energy, water and steam consumption (bills) and not a projection. This $3.5 million dollars is real money that the Treasury is keeping in the treasury. The announcement is even more monumental in the context of the green building movement and the evolution of these industries. The building world is changing. Treasury follows the path of another icon, the Empire State Building (LEED EB:O&M Gold) and comes only weeks after the announcement that the square footage of LEED for Existing Buildings – certified for actual performance – has surpassed New Construction. Despite little minds in Congress and worse in some state mansions, this movement is winning. Not only are new buildings becoming greener and more efficient, saving money for nearly centuries, but our architects, engineers, designers, contractors and manufacturers are working on the buildings we already have. Nothing could be greener. Congress recently passed the 2012 authorization bill for the Department of Defense (DoD) and included a provision that bans LEED certification at the Platinum and Gold level for DoD buildings. To be clear, this provision is irrational and misguided at best, and deliberately problematic for the leaders in the defense agencies at worst. But before reacting as if the sky is falling, it’s worth taking a deeper look at the “provision” and noticing that it isn’t really all that iron clad. Nothing in the bill indicates that the Department can’t keep certifying buildings, since the provision only forbids certifying to the highest levels of LEED. Why certain members of Congress think that our military service men and women do not deserve the best buildings possible is unanswerable. As background, DoD was one of the earliest users of LEED and has the largest number of LEED-registered and certified buildings owned or occupied by any federal agency. We doubt that the Department would walk away from a more-than-decade-long commitment to sustainability. DoD knows that LEED and building efficiency is delivering real savings to the department. In 2009, in its own Department of Defense Strategic Sustainability Performance Plan, DoD noted that energy use per square foot declined by 10 percent and total water consumption decreased by 4.6 percent, in spite of increased military operations. DoD can still LEED certify to Gold and Platinum levels if there is no additional cost or they document a positive return on investment, which they have done and will continue to do. For example, earlier this year, Navy Secretary Ray Mabus announced that new Navy and Marine Corps buildings would attain a LEED Gold certification level beginning FY 2013 and would do so at no additional cost. “It shouldn’t cost anymore, particularly in this economic environment, to build buildings that are sustainable than it is to build building that are not. It’s going to require some creative contracting and some creative building and construction practices, but I am absolutely confident that we will be able to do it,” Sec. Mabus said on Tuesday, May, 10, 2011. We think the Navy and Marine Corps will be able to keep their commitments despite obstructionists in Congress. Hopefully, this will be a learning moment for some of our elected officials on how build sustainably and how to reach these higher levels of performance. The one somewhat good thing in the bill is the request of a cost effectiveness study on LEED certification and other building efficiency tools, although it has been done before. A study released just this August by the General Services Administration (GSA) found their green buildings have 27 percent lower energy use compared to the national average, while reducing operational costs by 19 percent compared to the national average. LEED Gold buildings were singled out as being particularly high performers. We have no doubt that this new study will come to the same conclusion, and we are happy that this time the LEED Volume program can be specifically explored for DoD. We’d love to work even more closely with leadership agencies to certify more buildings and drive down costs. Bottom line – our military will be able to continue its leadership on sustainable building and energy security, despite the indefensible actions of some of our elected “leaders.” Something tells me that they’ll be able to rise to the occasion. Many communities are opening up their zoning codes to identify and remove barriers, and adopting language that will encourage greener building and greener living outcomes. You wouldn’t be surprised to hear that Portland, Oregon has been greening its zoning code for several years including a handful of updates this year. You might be surprised that other cities and counties, such as the City of Buffalo, NY and Will County, Illinois, are doing (or have done) the same through a community-focused comprehensive look at how the zoning code could better encourage the development of a greener community. In these last few weeks of 2011, both Philadelphia and New York are at milestones worth celebrating. The City of New York is the most recent to jump into the ring of rethinking the zoning code with their announcement last week of “Zone Green.” With a backdrop of many other successful initiatives related to Mayor Bloomberg’s PlaNYC, this initiative will be one worthy of following in 2012. Zone Green is an outgrowth of the extremely successful efforts of the Green Codes Task Force, coordinated by the Urban Green Council. 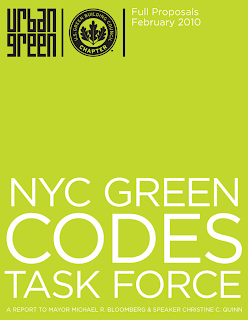 The Green Codes Task Force, which put forth 111 policy recommendations in a 2010 report, now claims 29 of those recommendations as victories, a few of which were adopted just last week. Last week’s code upgrades will improve building air quality, stop certain streams of wastewater from construction sites, and repurpose spent concrete into most new pavings. 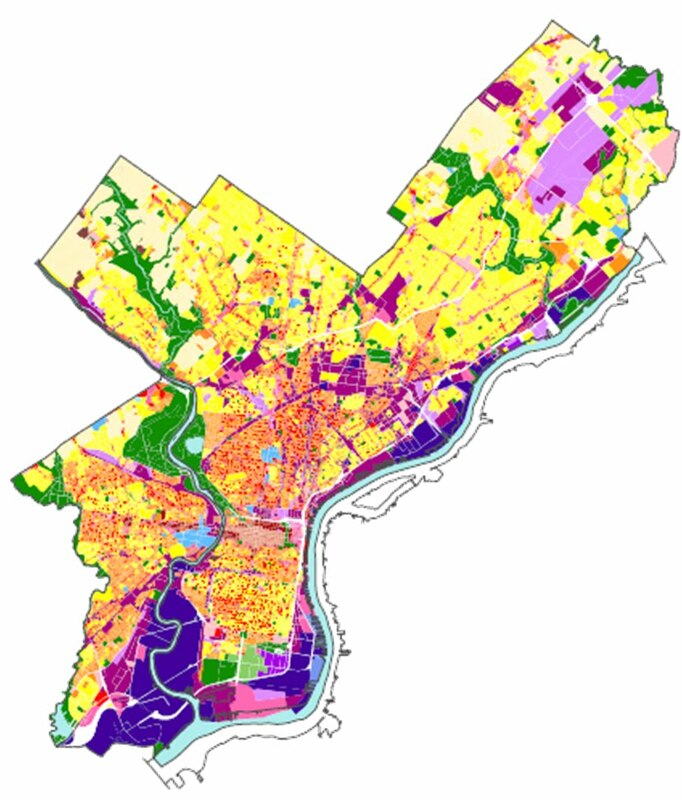 This week Philadelphia Mayor Michael Nutter will sign the City’s new zoning code that was adopted by the City Council last week. This is the City’s first zoning code update in 50 years. Among the long list of sustainability elements in the Zoning Code Commission’s final report are incentives for increased development density for commercial buildings that earn LEED Gold and Platinum. These LEED incentives are a popular way to encourage green building development, and are an important part of the City’s strategy to leverage the power of the zoning code to facilitate more sustainable development. Other areas of focus include: encouraging water conservation, promoting renewable energy and building energy efficiency, reducing vehicle miles travelled, promoting healthy, active lifestyles, and encouraging urban food production. There’s a lot to be optimistic about in the green building world in Philadelphia. The City is home to President Obama’s $129 million dollar investment in identifying and deploying energy efficient building technologies, policies and methods (see: Greater Philadelphia Innovation Cluster). USGBC’s local chapter organization – the Delaware Valley Green Building Council – is one of the strongest in our network. Philadelphia School District was awarded top spot amongst cities greening their school facilities in a Best of 2011 list released last week by the Center for Green Schools at USGBC. And if that weren’t enough, while in a restaurant in Center City two weeks ago before Cities Alive 2011, a waitress told me (effectively un-prompted!) that energy efficient, green, LEED buildings were all over the place, and that green real estate was the only thing renting or selling these days. If the wait staff in restaurants in your home town aren’t talking about a greener community (and even if they are), you probably have some things to gain from removing barriers and creating opportunity for green buildings, infrastructure and neighborhoods. LEED for Neighborhood Development looks at this scale of building, planning and development and metrics in the rating system can serve as guidelines to achieving local or regional sustainability goals. Open up USGBC’s resource page for local governments addressing community-scale planning and policy to see how the principles of LEED for Neighborhood Development can help you leverage the power of the zoning code to make sustainability happen in your own backyard. When our delegation of green building council representatives arrived in Durban for the COP 17 climate conference, we hoped we had what it took to help change the world. The diverse group seemed to possess that peculiar mixture of naiveté, enthusiasm and focused passion that can distinguish successful from merely aspiring troublemakers. Through participation and attendance at a variety of different events I was, as usual, impressed with the astounding effort on the part of various individuals and organizations to bring to scale energy efficiency and green building solutions. I was proud to be a part of this movement at the COP. 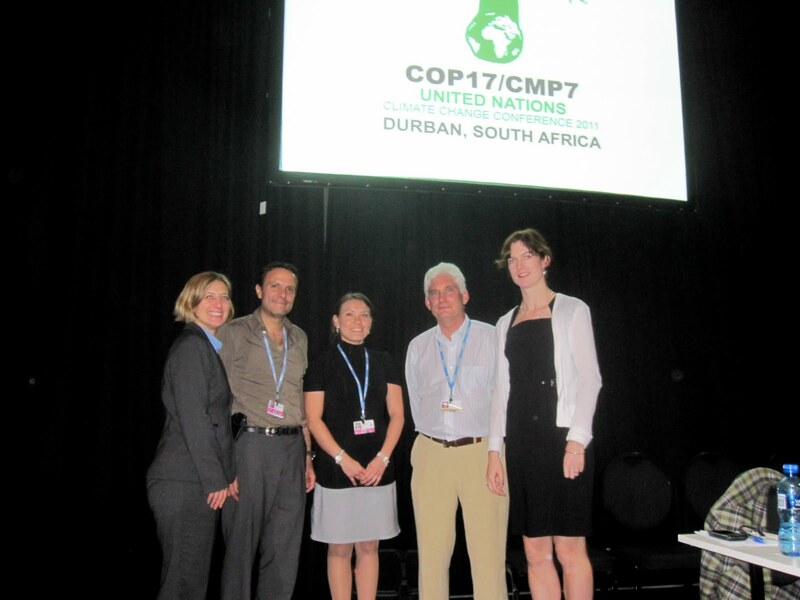 COP17 has officially ended on a generally positive note – the Durban Platform for Advanced Action was agreed to by parties (for pros and cons of the official outcome see Jason Hartke’s blog, “Good COP, Bad COP”). While nearly 200 countries reaching consensus agreement on the messy issue of the Kyoto Protocol is no small feat, I would be remiss to not also take this opportunity to wave the flag for a record number of parallel achievements in our small yet increasingly growing world of green building and energy efficiency within the UN Framework Convention on Climate Change. 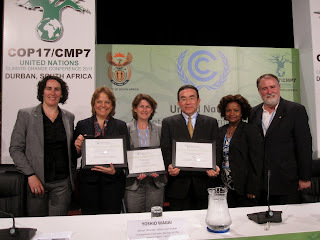 These achievements include (but are not limited to) a landmark report issued by the Institute for Building Efficiency that directly connects the dots to building efficiency in the UNFCCC context, six major international cities recognized for their progressive local green building policies, and an entire Durban street of low-income houses retrofitted for the occasion of COP17 among many other important initiatives. 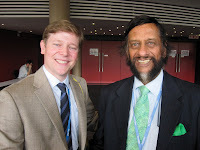 With so much happening it seems fitting to make a note of all the experts and talented people whom I encountered at COP17 with a shared agenda to make progress on green building in the name of climate action. My hope is that this good work doesn’t simply end along with the two-week negotiating session when everyone goes home and files their business cards away in a special COP17 pile. These lessons are important, relevant, and applicable now. Thus, I bring you, “Who’s Who in Green Building and Climate Change,” a cheat sheet of experts and accompanying resources from COP17 that will hopefully continue to foster global collaborations for the rest of the year. 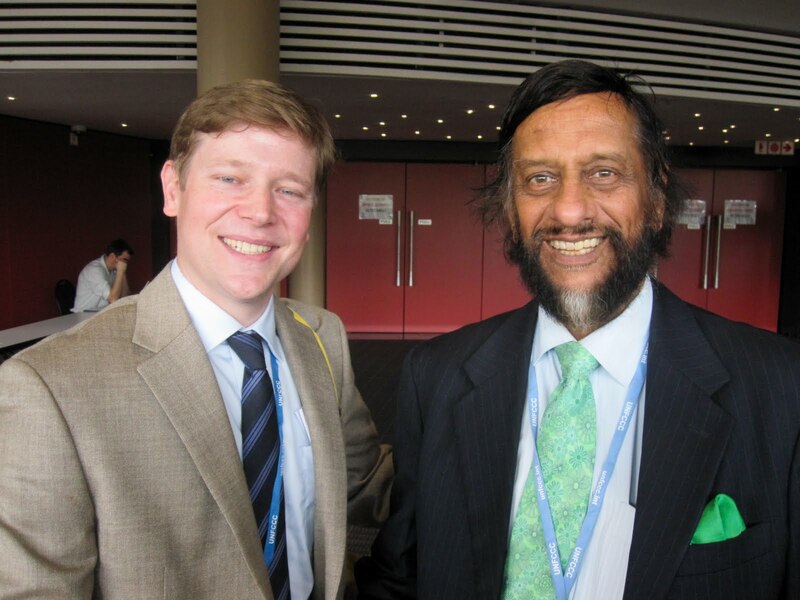 Jason Hartke (left with Rajendra Pachauri, Chairperson of the Intergovernmental Panel on Climate Change (IPCC)) and Hope Lobkowicz with USGBC represented the interests of green buildings as an integral component of emission reduction goals at the COP. Jorge Wolpert Kuri with the Mexico National Housing Commission gave an inspiring presentation on the Sustainable Housing Initiative that satisfies its Nationally Appropriate Mitigation Action (NAMA) as a Clean Development Mechanism (CDM) Programme of Activities (POA). Sandra López Tovar with the Colombian Ministry of the Environment revealed the progressive work that the Colombian government has pursued to mitigate the effects of climate change. Dr. Lisa Ryan and Philippe Benoit with the International Energy Agency and their 25 Energy Efficiency Policy Recommendations and Energy Performance Certification of Buildings in which LEED is highlighted as one of the most well-known and applied whole building rating schemes. Lisa Jacobson and Laura Tierney were at the COP on behalf of the Business Council for Sustainable Energy. BCSE hosted expert panels and facilitated the important discussion on the role of the private sector in global climate negotiations. Simon Reddy, Executive Director with C40 Cities, represents the interests of the 40 largest cities in the world which account for 18% of global GDP and 10% of global carbon emissions. C40 in inspiring and enabling cities to make the emissions reductions necessary to mitigate the effects of climate change to which countries are reluctant to commit. 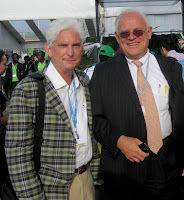 Reid Detchon, Vice President for Energy and Climate, and Mark Hopkins, Director of International Energy Efficiency, with the United Nations Foundation promoted energy efficiency as a low hanging fruit for emissions reduction opportunities. Kateri Callahan with the Alliance to Save Energy is a long-time ally of our mutual policy goals and mission. Thierry Berthoud, Managing Director, Energy & Climate at the World Business Council on Sustainable Development is prominently featured in the Guardian UK’s Sustainable Business Blog with his blog series on green investment. The WBCSD Energy Efficiency in Buildings Program facilitate emissions reductions made at least economic burden—through the low hanging fruit of energy efficiency. Jeff Moe, Director of Global Policy and Advocacy at the Center for Energy Efficiency and Sustainability, an initiative at Ingersoll Rand is a true UNFCCC expert and a consistent advocate for building efficiency in the global arena. Mark Watts, Director of Climate Change and Energy Consulting at ARUP, has become a notable player in the international policy arena. Their joint report with the C40, “Climate Action in Megacities,” explains the innovative policy-based prescriptions being pursued by the world’s 40 largest cities. We were excited to discover that nearly 30% of all city-level actions were building related and that buildings accounted for the largest sector of emissions reductions activity! Dan Hoornweg, Lead Urban Advisor for Sustainable Cities at the World Bank, is shaping the future of city-level efforts under the Clean Development Mechanism. Dan along with a vast team have developed a city-wide, multi-sector Clean Development Mechanism Program of Activities which has the potential of greening all sectors of a developing city, including buildings, energy and water use, waste management, transportation and much more. The first project of which is currently underway in Amman, Jordan. Safa Jayoussi with the Jordan Green Building Council who supported WGBC events while remaining very active in CAN International efforts to pressure negotiators for a better outcome. Its unquestionable that we have Safa and her colleagues to thank for keeping Kyoto alive coming out of COP17. Stephane Pouffary, founder, President and General Director of ENERGIES 2050, was a pleasure to meet as an expert on the inclusion of buildings under international climate finance mechanisms, including the Clean Development Mechanism and Nationally Appropriate Mitigation Actions. Carl Wesselink with South South North who developed one of the first building-related CDM projects which retrofitted over 2,300 low income housing to be more energy and resource efficient in Cape Town, South Africa. Bruce Kerswill, Executive Chairman, and Brian Wilkinson, Chief Executive Officer, (and the rest of their incredible team) at the Green Building Council of South Africa who organized the Cato Manor retrofit and hosted the members of the World Green Building Council in their beautiful home country. Nicola Brewer, British High Commissioner who was the major sponsor of the Cato Manor Retrofit and who additionally accepted the Urban Retrofit Award on behalf Birmingham, UK in the WorldGBC Government Leadership Awards press conference. The community of Cato Manor in Durban, South Africa – who welcomed us into their homes to witness the impact that this green retrofit has had on their lives. Larry Schweiger (at right), President and CEO of the National Wildlife Federation, joined us at the Cato Manor event. USGBC and NWF work closely to advance green schools through the Department of Education’s Green Ribbon program. Pooran Desai and Sarah Alsen with BioRegional, which has developed a One Planet Living framework for sustainable communities based off the simple notion that, after all, we only have one planet to support us. If everyone lived like Americans, we would need the resources of five planet earths. Rodney Milford with the Construction Industry Development Board of South Africa and the UNEP Sustainable Buildings and Climate Initiative. Nana Mhlongo (at left) with the Council for the Built Environment who also serves on the Advocacy Committee of the UNEP Sustainable Building and Climate Initiative. 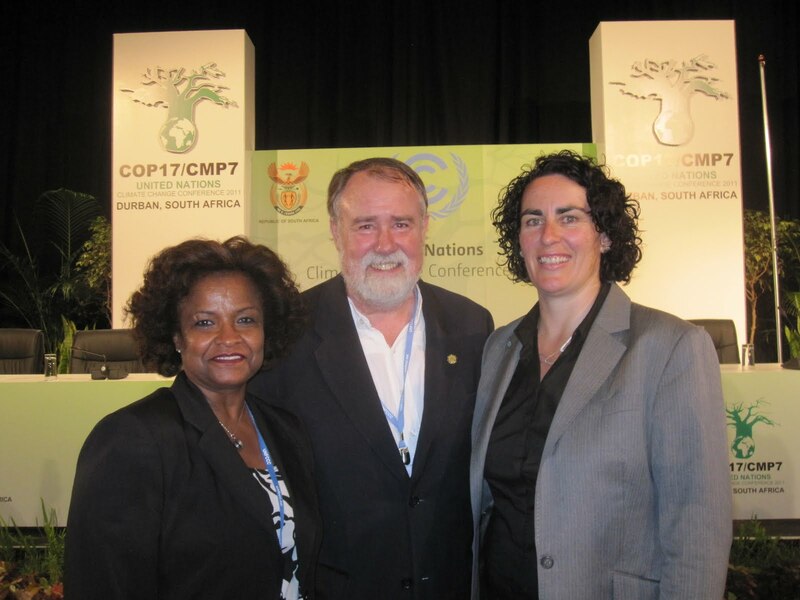 Romilly Madew, the CEO of the Green Building Council of Australia, who was instrumental in securing funding from the Australian government for the Cato Manor COP17 legacy project and who spoke to WGBC’s efforts on sustainable cities. Jane Henley, CEO of the World Green Building Council who spearheaded the WorldGBC Government Leadership Awards and who continues to be the global ambassador for green buildings and GBCs wherever she goes. At right is a photograph of some of the award winners and representatives from the partner organizations for the competition. 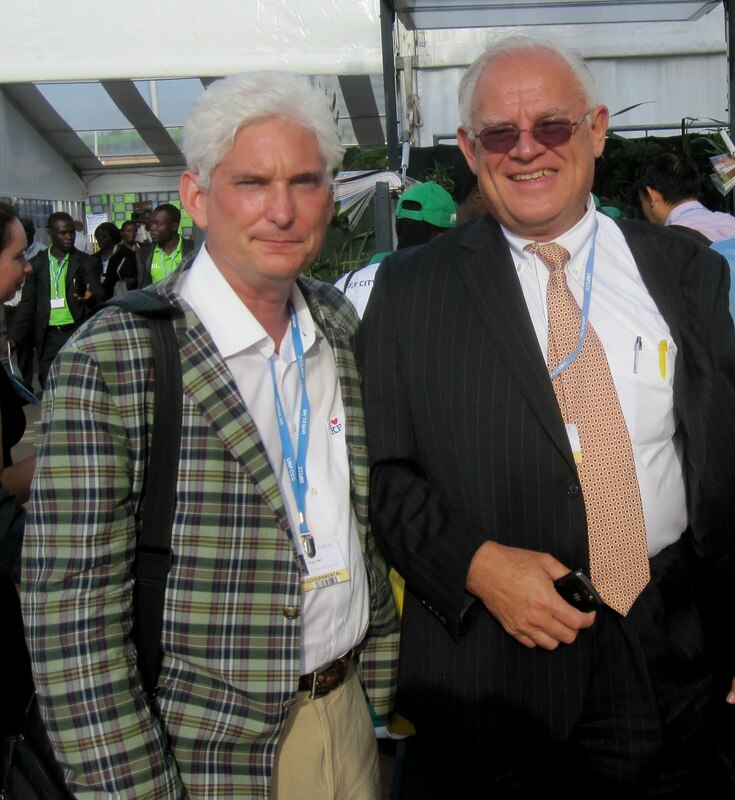 David Cadman and Yunus Arikan with ICLEI International, a partner of the Government Leadership Awards, attended the conference on behalf of their extensive network of local governments. Axumite Gebre-Egziabher and Raf Tufts with UN HABITAT, the third partner of the Government Leadership Awards. Their Sustainable Cities Programme helps cities build capacity and improve their urban infrastructure. Martha Delgado, Minister of the Environment with the Government of Mexico City accepted the Climate Action Leadership Award for their Climate Action Plan. Yoshio Wagai, Kenji Suzuki and Yuko Nishida with the Tokyo City Government and the Tokyo Emissions Trading Scheme, which was awarded the Most Groundbreaking Policy Award. We are extremely excited about this innovative policy to address GHGs from buildings and look forward to working with the City of Tokyo on developing a policy template that is replicable worldwide. For more photos from USGBC's trip to Durban, visit our Facebook album. 3,500 commercial and 5,400 residential projects were LEED certified this year, with cumulative totals exceeding 11,000 and 14,600, respectively. And another 31,800 commercial and 61,500 residential projects have been registered. More than 125,000 projects are part of LEED –– an extraordinary accomplishment. And now we look forward to the development of LEED 2012, focusing on the technical rigor of the rating system, expanding the market sectors able to use LEED and striving for simplicity in terms of usability. When enrollment closed in October, more than 61,000 LEED APs had opted into LEED AP with specialty credentials. Today, more than 175,000 professionals hold a LEED Professional credential and the industry is even more equipped to handle the different types of building and community projects coming through. In September, we announced the 34-member inaugural class of LEED Fellows, the most distinguished professionals in green building. These folks are inspirations to us all. This year our USGBC chapters played a critical role in influencing local and state government policy. The Charlotte Chapter worked closely with local officials to get Oct 24-28 declared Environmental Sustainability Week, coinciding with a series of sustainability programs hosted by the chapter. The Delaware Valley Green Building Council received a USGBC innovation grant that has enabled them to develop a green building legislation "action alert" online system. The California Advocacy Committee, representing all eight California chapters, kicked off its first year of statewide collaboration around green building policy and advocacy with a new, community-developed model for decision-making and engagement and already has a list of wins. Our national and chapter members are working hard to fulfill the Administration's Better Buildings Initiative, supporting the aim to make America's commercial buildings and plants more energy- and resource-efficient over the next decade by providing incentives for private-sector investment. The Center for Green Schools at USGBC placed the first Green Schools Fellows in Sacramento and Boston, and commissioned the first nationwide survey on green schools with founding sponsor United Technologies, hosted a Healthy Schools Summit and released its inaugural "Best of Green Schools" list. Despite the challenges of holding the first Greenbuild outside U.S. borders, Greenbuild secured a record number of partnerships, sold out our expo floor and welcomed 23,000 attendees to Toronto. With the help of our progressive host city and devoted volunteers, we achieved 95% waste diversion, setting a Greenbuild record. The USGBC App Lab launched in November as part of LEED Automation, which is transforming the way project teams interact with LEED data. Comprised of applications designed by LEED Automation Partners for Web browsers, tablets, smartphones and other devices, the App Lab simplifies the certification process and maximizes building performance. As of this month, cumulative square footage of LEED-certified existing buildings surpassed LEED-certified new construction for the first time. As the U.S. is home to more than 60 billion square feet of existing commercial buildings, most of which are energy guzzlers and water sieves, this trend serves as a promising indicator of our progress. This is just the tip of the iceberg of the hundreds of accomplishments that we can celebrate this year, as we should. But we also have much to do. As we enter this season of giving, the USGBC family has always been a generous one, especially as we've worked to bring the benefits of green building to those who need it most –– populations made vulnerable by age or poverty or natural disasters. And this year we continue our work on behalf of the impoverished victims of the 2010 Haiti earthquake. Through the generous USGBC community, we have secured contributions and pledges totaling more than 50% of our fundraising goal for Project Haiti Orphanage and Children's Center, a zero-impact, LEED Platinum facility and Clinton Global Initiative Commitment of 2011 that will not only provide for the immediate health and emotional needs of orphaned children in ravaged Port-au-Prince, but will also serve as a model for sustainable rebuilding and a teaching tool for local architects, contractors and students. As you consider your year-end charitable contributions, we urge you to consider a contribution to Project Haiti at USGBC.org/Haiti so we can bring this important effort to fruition. Celebrating our achievements of the past year, I gaze ahead with great optimism. The economic and political winds continue to shift, but in spite of that, green building continues to thrive, and the stage is set for a remarkable 2012. Thank you for your significant contributions to this transformational journey toward a more sustainable, healthy and prosperous built environment. From all of the staff at USGBC, we wish you a safe and joyful holiday. The green building movement has made great strides in recent years, but it’s not enough. In order to put up a good fight against ever-increasing environmental and economic pressures, we need a united front of the public and private sector, and to approach issues at the city — or district — scale. District sustainability currently experiences the same limited level of awareness that individual green buildings did a decade ago, when the U.S. Green Building Council announced its first 12 LEED Certified projects, of which there are now over 11,000. Get ready for a paradigm shift. The Seattle 2030 District is an innovative, private-sector led project attempting to create a groundbreaking high performance building district in downtown Seattle. The project is already gaining national attention; earlier this year, the 2030 District was selected by the U.S. Department of Energy to represent Seattle — along with the cities of Los Angeles and Atlanta — as a “Place-Based Ally” to launch President Obama’s Better Buildings Challenge. By 2020, this program aims to reduce commercial building energy consumption by 20 percent nationwide. The 2030 District model of private-sector engagement and aggregated goals is unique among the three selected cities, and will serve as a guide for other cities to follow. The District has key support and partnership from the City of Seattle and King County, but is being led largely by the private sector: property owners, managers, developers, engineers and design professionals who believe that setting aggressive energy performance targets at the district level is the key to elevating our region’s economic and environmental potential. Working together, civic leaders adopted the goals from the 2030 Challenge for Planners, which adds reductions in water consumption and vehicle miles traveled, to the energy and fossil fuel building reduction targets of the 2030 Challenge. These goals, to be met by 2030, include aggregated district-wide reduction targets of 60% reduction in energy from new construction, 50 % reduction in energy from existing buildings, 50% reduction in water, and 50% reduction in carbon emissions from auto and freight. These voluntary commitments are not empty promises. District members are required to share, under proprietary agreements, building energy, water, and transportation data, join the Seattle Climate Partnership, enlist in ENERGY STAR Portfolio Manager, and submit LEED buildings to USGBC’s Building Performance Partnership. In return, the Seattle 2030 District is delivering innovative financing vehicles, sharing critical industry tools and best practices, and creating joint education opportunities to participating property owners and developers. Improvement districts are not new — but the Seattle 2030 District takes a novel approach to the concept. District-wide reduction goals for energy use, water use, and CO2 emissions translates directly to using less power, water and fuel. While this may be hard to conceptualize, it yields tangible results: less traffic, better indoor and outdoor air quality, a more pleasant and desirable urban environment, a healthier Puget Sound and greater economic activity. These are the changes that Seattle and other growing urban areas must make in order to maintain vibrant and competitive cities in an era of population growth and resource overconsumption. But don’t environmental priorities run counter to economic ones? Not always. Take energy use, for example. Buildings use approximately half of all energy consumed in this country. Reducing that use will take human energy: conservation managers, building auditors, manufacturers and installers of more efficient equipment — in other words the green jobs we’ve all been hearing about. For decades, it’s been cheaper to displace human labor with fossil fuel energy in the U.S., and we’ve followed that trend to its logical economic conclusion: high unemployment and rising energy prices. Yet thanks to those rising energy prices, projects to make buildings resource-efficient can more convincingly provide faster financial paybacks and higher asset values for building owners and investors. These conditions, paired with the right partnerships, technologies and financing solutions increases our ability to scale efficiency projects more broadly. The Seattle 2030 District aims to be the catalyst to make that scale reality. There is no one-size-fits-all prescription to achieve the performance goals necessary to survive and thrive. Property owners and managers should be free to pursue the most innovative solutions to generate the best financial returns or other desired benefits for their property. The bottom line is that the private sector must take the lead in transforming our economy away from fossil fuel dependency. More than 60 organizations, and over 23 million square feet of building space (30 percent of downtown Seattle) are participating in the Seattle 2030 District, a model that can lead the country in that transformation. It’s time to join forces; 2030 is right around the corner. You know the hard work and dedication of time it took to earn your LEED Professional credential. It’s important to remember that there is also a renewal process every two years. Renewing your LEED credential renews your sense of personal accomplishment as well as your commitment to green building and continued contribution to the sustainability movement. The Credential Maintenance Program (CMP) was crafted with input from those in the green building industry and is designed to broaden and deepen your scope of knowledge within the field of green building on a continual basis. Maintenance requirements allow for credentials to stay relevant and maintain a professional’s credibility and competitive edge. In a recent survey, 85% of current LEED credential holders say that having the LEED credential gives them a competitive edge and credibility in their field of work; 92% say it indicates a greater commitment to green building; and 97% say it supports their professional development. Complete your specified number of continuing education (CE) hours in a variety of flexible ways. As you earn them, report your CE hours under My Credentials at GBCI.org. Upon reporting enough hours to fulfill CMP requirements, click “Renew My Credential,” a blue button in your my Credentials account. If you are eligible to renew your credential, you will be prompted to pay your $50 renewal fee and your credential will be renewed for two years. LEED Professionals who opt out of CMP will forfeit their credentials. If you ask me, the expansive benefits of renewal are too good to let go. Use #LEEDPros to join the conversation on Twitter. Last Friday, I went to work just like any other day at my firm, Fore Solutions, here in Portland, Maine. I fired up my computer, but instead of the normal updates on projects and industry newsletters, I was greeted with eye-popping subject lines. “Maine bans LEED!” was just one example. Thinking that can’t be right, I opened a few to find that Maine Governor Paul LePage issued an Executive Order banning LEED on state capital projects to satisfy out of state industry interests. Just like that, Maine goes from a leader to a laggard. Forcing the professionals who design and build new state buildings to stop using the most widely used green building rating system (LEED) is not in the voter’s interests. Not only will this be damaging to Maine’s architects, engineers and contractors who are leaders in the green building world, but it is also an embarrassment for the people of this state, for whom conservatism means environmental conservation as much as fiscal. And bottom line, the economics don’t make sense either. So I must ask, why is the Governor trying to throw an important piece of our economic engine in reverse? What Governor LePage has failed to recognize is the transformational role that LEED certified capital projects have played in catalyzing building activity throughout our state. As a state we rank 12th in the nation for LEED certified green building space on a per capita basis. That’s 1.6 million square feet, much of which would not have happened if LEED weren’t the market standard for communicating green building success. I was a founding board member of the Maine chapter of USGBC, and I can tell you that Mainers can do more. This decision leaves a community of 67 USGBC member companies in the state who contribute more than $5 billion annually to our state’s economy out in the cold. But this executive order creates another barrier to achieving all of Maine’s potential. It takes away one of the most effective tools that the state has to achieve better buildings that are cheaper to operate and therefore easier on Mainers’ wallets and healthier places to live and work. Building green is not red or blue, left or right. As a New Englander, building green appears to me to be just good common sense. It’s doing more with less, and increasing quality, value and performance… and we’re saving energy, water and money, too. Given that green building is a “bright spot” in an otherwise tough economy (and reports by McGraw Hill and many others will back me up) – and if we care about the future of the Great State of Maine – why would we disallow the world’s most well-known, respected, and continuously improving green building rating system and certification program? If this is motivated by the unsubstantiated fears of wood industry interests (as it appears to read), let me spell it out: I specify wood from Maine that has not been specifically labeled as “sustainably harvested” in my LEED projects, and earn credit for it because it is local. I also specify some sustainably harvested wood from Maine and elsewhere, but when it’s local, it counts twice! As a member of the Maine building community - and someone who cares deeply about green building practices – banning LEED in Maine state projects simply makes no sense. I urge everyone who has a stake in a greener, brighter, more sustainable Maine to reach out to the Governor and make sure he understands that this Executive Order is not the answer to industry woes, but a step backwards in the march toward better buildings for the state of Maine. As we at USGBC wind down 2011 – and gear up for a promising 2012 I am pleased to have the opportunity to reflect on what an incredible year it’s been for green schools. With the help of our seemingly tireless volunteer and chapter network, the Center for Green Schools at USGBC has had a first year that has exceeded many expectations. Even heading into a time of year when things typically seem to slow down, USGBC’s volunteers continue to be hard at work on behalf of green schools. To learn more about the recent goings-on of Green Schools Committees from coast-to-coast, read on, and be sure to check out this video from the 2011 Green Schools Committee Symposium held this past summer. To get in on the action, find a committee near you. I had a few opportunities to see these volunteers in action throughout the year, and started things off in San Francisco back in April. USGBC Colorado and Northern California Green Schools Committee leaders Peggy Kinsey and Pauline Souza joined me at the National School Boards Association’s 71st Annual Conference, where we met with school board members from around the country to work toward our country-wide green schools goals, and they shared their stories of building grassroots green schools movements in their own backyard. In May, the Detroit Regional Chapter participated in the local Green Living Festival. On the eve of the festival, the chapter’s green schools committee was joined by dignitaries, community leaders and media for an evening of celebration, featuring a fashion show, live music, networking and organic treats. The evening was capped off with an awards ceremony to recognize the dedication and achievement of several Michigan green leaders. Proceeds from the event went to the Chapter’s Green Schools Committee’s Green School in a Lunch Box project -- their 2010 USGBC Green Schools Innovation grant winning initiative! Montana Chapter Green Schools Committee members Wendy Weaver and Dawn Smith co-authored a piece for Montana Parent Magazine, introducing their state to Center for Green Schools initiatives and how they’re being implemented in the Treasure State. Just in time for the new school year, Mississippi Chapter Green Schools Committee Chair Sally Zahner and her committee were involved in the groundbreaking for what could be Mississippi's first LEED certified school, Hancock North Central Elementary. The school in coastal Mississippi is being built with a combination of funds from the district and FEMA, and in addition to being green, a portion of the new structure will be able to withstand 200 mile per hour winds. In October, USGBC Orange County (California) kicked off their Adopt-a-School project, which will connect volunteers with nearby Davis Magnet School in Costa Mesa. GSC members will work to promote the school as a teaching tool, while actively providing a school with a classroom makeover. Congrats to Green Schools Committee Chair Wendy Rogers for securing some major local partners. The USGBC Arkansas Chapter launched the Arkansas Green Schools Challenge just before Thanksgiving. Green Schools Committee Chair Dustin Davis reports that 41 schools across Arkansas have already signed on to participate in the competition that will “empower students and communities to be good stewards of their own environments.” Dustin partnered with Arkansas Association of Educational Administrators (AAEA) to kick this off. Just up north, the USGBC South West Virginia Chapter’s GSC Chair Steve Sunderman is busy preparing for his chapter’s second year of the VA Green Schools Challenge, coming in 2012. To close out the year and open up a newer side of the green schools conversation, Chris Tyler and the Kentucky Chapter helped bring together a bipartisan team of state legislators at Richardsville Elementary in Bowling Green, Ky., to discuss political common ground around the topic of green schools. Richardsville is the nation’s first net-zero energy school, and serves a 78% free and reduced lunch population. The school was constructed without spending any additional money than the conventionally built schools in the Warren County School District. Lawmakers from six states around the region discussed ways to work together to advance the green schools movement in their communities. You can read more about the day’s events and the incredible story in Warren County. It’s been another incredible year for the green schools movement, and with this many advocates and champions out there, I know that we have all the more to look forward to in 2012. This is part two in our blog series on USGBC chapter advocacy efforts. Also see part one in the series. Representative Ron Kind (WI), alongside Senator Mark Udall (CO), recently introduced the Healthy Kids Outdoors Act. This bill would authorize the Secretary of the Interior to carry out programs and activities that connect Americans, especially children, youth, and families, with the outdoors. We asked Rep. Kind to tell us a bit more about the act, as well as how its intention relate to the goals of the green schools movement. As an elected official and community advocate, you’ve long worked to protect and preserve our natural resources. You also have a strong personal commitment to physical activity and a leadership role in the Congressional Fitness Caucus. How have trends around outdoor activity changed in recent years? Trends around outdoor activity have change significantly in recent years, particularly among our youth. Today, kids spend a majority of their time inside, plugged in playing video games or watching TV. Studies show that children spend less time outside today than at any other point in history. Kids spend half as much time outdoors as they did 20 years ago and on average 7.5 hours a day in front of electronic media. When it comes to outdoor play, children devote only 4-7 minutes each day to outdoor activity. These statistics point toward a huge shift in the way kids “play.” It is resulting in increased obesity rates and a lack of a connection with the outdoors and nature. Could you describe what the Healthy Kids Outdoors Act does and how you and others in Congress determined this was needed? An avid outdoorsman, there is nothing I enjoy more than spending weekends out hunting with my two boys. Unfortunately, this legacy of outdoor recreation isn’t being passed down to enough of the next generation. The pull of technology and busy nature of today’s families has resulted in a lack of physical activity amongst our kids and children staying indoors to play - resulting in a lack of appreciation for the outdoors and nature. This growing nature deficiency threatens the future of conservation in this country, is impacting obesity rates, and threatens our national defense. In order to reverse these trends, I thought it was important to introduce legislation that would facilitate and promote outdoor recreation in our communities. This legislation provides state-level incentives to develop 5-year state strategies to connect children, youth, and families with nature. As you know, Wisconsin is a leader in the green schools movement. Lake Mills Middle School in Lake Mills, WI is a LEED Platinum school, and Wisconsin was also one of 34 states that signed up to participate in the pilot year of the Department of Education’s Green Ribbon Schools program. Tell us about the role of schools in promoting healthy lifestyles and how the Healthy Kids Outdoors Act can help in this effort. Kids spend a majority of their time at school meaning that schools have to be a part of the equation in solving the obesity crisis. I have long advocated for an increased role for schools in assisting with this crisis, most notably with my Fitness Integrated with Teaching (FIT) Kids Act, H.R. 1057. This bill will work to get physical education back into schools. The Healthy Kids Outdoors Act can also provide schools with a role. The 5-year state strategies can include the upgrade of playground equipment or the addition of trails around schools, including recreation trails for students to walk and bike to school. In addition, these tools can be used during physical education class to get kids active while teaching them the importance of being active outdoors and enjoying nature. In addition to the Healthy Kids Outdoors Act, what else will it take to end the childhood obesity epidemic? It has to be a combination of factors, there is no silver bullet. And it can’t be a top down approach from the federal government. It has to be a combination of incentives, greater family awareness, and work from community-based organizations that will help get this problem in check. This is why I introduced the Healthy CHOICES Act during the last Congress. This bill was the first of its kind to work to comprehensively address the obesity epidemic. There are so many different areas that need to be the focus in order for us to get this problem under control that it requires work on many different levels and from many different facets. Everyone has a role to play, and passing initiatives like the Healthy Kids Outdoors Act, the FIT Kids Act, and initiatives included in the Healthy CHOICES Act will help facilitate change where it needs to happen first, at the family and local level. How do you respond to people who question whether Congress should be involved with issues like this in light of other competing national priorities? This issue is extremely important and should be a priority, because it affects so many other things happening in the national debate right now. Health care costs are the single largest factor impacting deficits in this country. If we don’t get obesity under control, chronic health problems later in life will continue to cost the system billions of dollars each year. A lack of interest in the outdoors can also lead to a decline in the outdoor retail industry, which could seriously harm a major economic presence in rural America. Also, our military readiness is declining. Nearly one in four applicants for the military is rejected for being overweight or obese. This is why Congress has should be working to not only increase physical activity among our children but facilitate and promote outdoor recreation. What can students, parents, educators and community advocates do to support the efforts to promote outdoor activity and pass the Healthy Kids Outdoors Act? Grassroots support is crucial for a bill such as this. The more that people contact their representatives and let them know the importance of this legislation, the greater the chance that the member will pay attention to the cause and sponsor the bill. Gaining support and continued attention will give this bill the momentum it needs to move forward and help our children lead active, healthy lives. This week, the U.S. Green Building Council celebrated the first graduates of the USGBC Emerging Professionals Leadership Academy. The Academy identifies future leaders in sustainability and fosters their development through educational trainings and special projects completed with the support of the individuals’ local USGBC chapters. The 2011 class comprises a diverse group of 36 outstanding young professionals between the ages of 21 and 30 hailing from five countries, 18 states and the District of Columbia. The program has equipped them with leadership skills to impact organizations and communities across the globe. The class received premier leadership training through a series of webcasts drawn from USGBC’s renowned collection of online educational resources. The class later convened in Atlanta where they engaged with prominent leaders within the USGBC community and in the field of sustainability. In the final phase of the eight-month program, participants employed their new leadership skills as they led sustainability-oriented projects designed to benefit their respective communities and USGBC chapters. Graduate Jeremy Knoll of the Central Plains USGBC chapter organized three service-learning workshops in the Kansas City area for his special project. Each focused on a specific topic in sustainable technology and green living. Developed through the collaborative effort of residents, community leaders and like-minded organizations, these workshops offered AIA continuing education credit and developed a range of community enhancements, including the construction of bird feeders and planters using recycled material at a community center for impoverished children and the establishment of a community garden with a rainwater-only irrigation system. As a result of the project’s success, the Central Plains chapter received USGBC’s Chapter Innovation Grant, and Jeremy was nominated to join the chapter’s Board of Directors. Use #EPacademy to join the conversation on Twitter. Despite the long list of challenges that governments face today – the down-economy, which drives budget constraints, which drives partisan politics, which drives gridlock, which fails to deliver basic government services, which can impact the economy… – our green building conversation continues to resonate with diverse audiences. In August, USGBC released a report detailing some of the conversations that took place in 2011 and how these conversations translated into real world policy impact. And while not every policy advancement can be traced directly back to USGBC advocacy efforts, many can. The collective success of our green building community in a year as challenging as 2011 goes to show that engaged, motivated, prepared, and organized green building advocates can execute successful advocacy campaigns in almost any environment. Through the organized leadership of the USGBC Chapter network, committed volunteers and advocates have resources which enable them to put in the time, effort, and hard work necessary to make so many of these home-grown advocacy campaigns so successful. I want to thank all USGBC Chapters, volunteers, and the green building community for continuing the push year after year in advancing green building issues. As this year ends, I want to reflect on the local and state-wide initiatives, propelled by USGBC chapters, that pushed green building efforts further and scored big successes for our common goal. As we all head in to 2012 advocacy planning, these excellent campaigns from 2011 can serve as inspiration. All Texas chapters organized their 2011 State Advocacy Day in Austin on Feb. 22. The event brought 40 advocates together to speak with more than 90 state legislators and staff. The Colorado Chapter produced a Colorado Green MLS training and informational video and supported the Green Lending Task Force by traveling through Western Colorado, working with local realtor groups and consumers to promote green homes. The Illinois Chapter established the Green School Task Force as a way of supporting the chapter’s Advocacy Day with the Illinois General Assembly and releasing the Task Force’s most recent report. The USGBC-Northern California Chapter (USGBC-NCC) continues to build on the Chapter’s strong foundation of robust local efforts around green schools, healthcare, neighborhoods, and residential advocacy in 2011. Efforts included: Appointing seven regional experts to chair/co-chair the committees, recruiting and engaging 60 application advocates, and creating internal Operating Guidelines. The California Advocacy Committee, representing all eight California chapters, kicked off its first year of statewide collaboration around green building policy and advocacy with a new, community-developed model for decision-making and engagement. See here for a list of their wins. All seven Florida chapters collaborated to execute an advocacy day in Tallahassee on March 29. The event engaged nearly 30 advocates and reached more than 90 state legislative offices. All three Tennessee chapters hosted a green schools bus tour for state legislators that took USGBC advocates and state legislators to two LEED-certified schools in the Nashville area on Apr. 11 and 12, and are planning similar upcoming outings. The Idaho, Montana, and Wyoming chapters worked together to create outreach and education programs on “Greening the Multiple Listing Service” in each of the three states. These programs are targeting real estate and neighborhood associations in rural areas of Idaho and Montana, and establishing a presence in Wyoming for the first time. All three Pennsylvania chapters (Central Pennsylvania, Green Building Alliance and Delaware Valley Green Building Council) have invested a lot of preparation into launching a collaborative state advocacy day in Harrisburg in January of next year. The primary focus of the advocacy efforts will be to compel legislators to support policies that promote leadership by example in state facilities, green schools, and innovative financing for green buildings. The Missouri Gateway Chapter’s Technical Committee has been working with code officials and other experts on codes and standards this year on how to advance greener building codes, and also promoting the State of Missouri’s energy code workshops. In response to the needs highlighted in the many conversations with this community, the chapter is currently developing a presentation that code officials can use to inform their colleagues, inspectors, other city staff, elected officials and the general public. All three North Carolina chapters worked hard with their peers across the state to promote the adoption of the North Carolina 2012 Energy Conservation Code. This code – effective Jan. 1 of next year – unlocks significant energy savings beyond the current state building code. This effort was a primary focus for the chapters’ North Carolina Legislative Day in February 2011. The Kentucky Chapter has developed a first-of-its-kind resource for USGBC’s chapter community on how to run an effective advocacy day at the state legislature. I apologize if I missed any campaigns or programs run by your local green building community and USGBC Chapter in 2012. But we here at USGBC National really want to make sure to highlight local and state advocacy campaigns in 2012. We want to recognize great work but also many of the homegrown advocacy efforts can serve as inspiration for other campaigns in other areas. So please, email mpearce@usgbc.org with the cool advocacy activities taking place in your area and I’ll make sure they are highlighted here on the blog. Looking to join the green building movement? Join a USGBC Chapter and help make a difference next year! Join your local chapter to get started. Tomorrow, we'll post part two in our wrap-up of regional advocacy efforts: A highlight of green schools initiatives. Like on any of the nighttime dramas, we watch time and time again how yet another police duo utilize the classic good cop/bad cop routine. 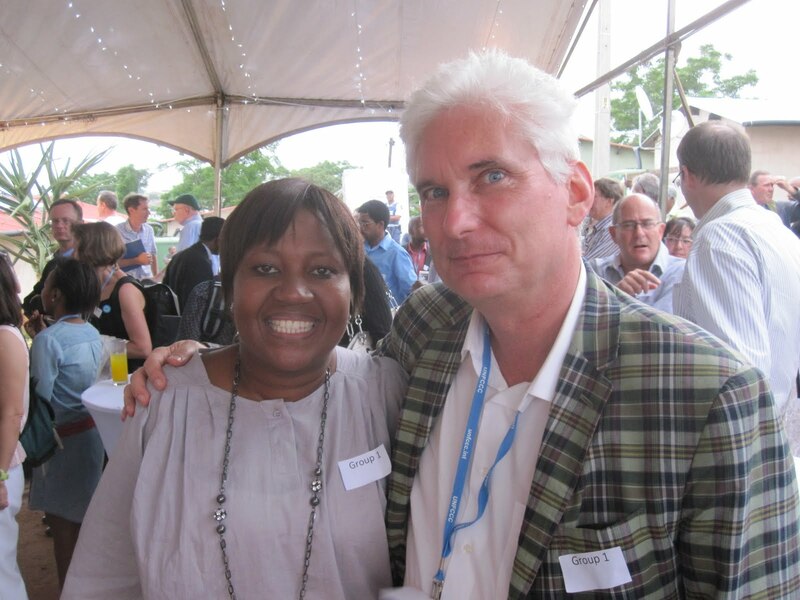 Well, in my final blog from Durban, I leave you with my own good COP/bad COP. Let’s play good COP first. The design for this critical funding mechanism was inked in Durban, too. The Germans are putting up $40 million to create the implementation infrastructure to get this fund off the ground. But apparently more headway was needed to figure out how countries are going to fund it and at how much. The promise of the fund in Copenhagen (COP15) was to grow it to $100 billion a year by 2020. UN Secretary General Ban Ki Moon’s urging that it “must not be an empty shell” has yet to be addressed with any actual money. For the past two weeks, many experts and pundits were suggesting that Durban would be the final resting place of the Kyoto Protocal, the 1997 global pact enforcing carbon reductions. The reports of its demise, using a Mark Twain expression, were highly exaggerated. Kyoto received a five to seven year extension taking it out to 2017 or 2020. The night sky of Durban frames a construction crane. With long hours spent tucked away in the recesses of a conference center, too few negotiators and delegates were able to see the glint of the sun sparkle off the waves crashing onto the shores of Durban, the beautiful South African host city facing the vast expanse of the Indian Ocean. In a country known for some of the wildest, most majestic places on Earth, I’m not sure anyone was prepared for the wave of discontent, discouragement and dismay that also swept through the city as action and agreement at COP17 seemed to be consistently trumped by delay and division. Through it all, the city was a gracious, friendly and hospitable host to more than 16,000 participants from more than 190 countries. Your reason for coming to Durban was made quite clear from the outset. Upon arriving, negotiators and delegates saw banners and signs the host country placed all over the city announcing the conference’s motto: “Working together to save tomorrow today.” Echoing that sentiment, a variety of world leaders tried to put the global meeting in perspective, arguing that COP17 was about nothing less than negotiating the world’s future. The exclamation point on that perspective came from several delegates from the world’s small island states, who told us that failure to take global action soon would literally leave them under water and without a home. But even with scientific clarity around the devastating impacts of climate change, countries are responding with varying degrees of urgency, unsure about how to effectively and fairly balance the economic challenges of today with certain intensifying difficulties of tomorrow. One of the best analogies to describe our climate future comes from James Hansen, a premier U.S. climate scientist, who famously referred to climate change as “a ticking time bomb.” The analogy is simple: We can defuse the bomb if we act quickly or we’ll be forced to pick up the pieces after it detonates. And one thing he says every chance he gets is that time is running out. But international negotiations are nasty, brutish and, this is the departure from Hobbes, long. It was somewhat encouraging as negotiators worked into the weekend to salvage some agreement in Durban, but many were left wondering if we’re waiting too long. Students from a youth delegation at COP17 wear the “I love KP” t-shirt. KP standing for Kyoto Protocol. When it comes to a Facebook relationship status for the world’s countries working to craft a climate deal, they’re still just "In a Relationship." There might now be an engagement, but there’s certainly no marriage. Covering Durban was like trying to listen in on a couple talking about whether or not to get engaged…maybe. Ultimately, the plan advanced during the final days in Durban to move on a legally binding carbon reduction plan is a commitment to commit later. Sure, it was what salvaged a deal and now all emitters will be held accountable. But climate change is accelerating and a finalized agreement by 2015 wouldn’t go into effect until 2020. If I recall, the motto was “working together to save tomorrow today,” not 2020. 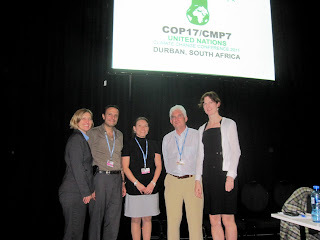 For more photos from Jason's trip to COP17, browse our Dispatches from Durban album on Facebook. As a former teacher, I’ve seen first-hand the transformative effect that great educational environments can have on teacher motivation, student performance and community engagement. I also know that parents are unfailingly dedicated to their children’s education and will do just about anything to give their kids an advantage in life. Over the past year, we at the Center for Green Schools have witnessed thousands of volunteers, educators, school administrators and policy makers transforming our nation’s schools into inspiring places where children learn and thrive. 2011 was a landmark year for the green schools movement, so you can imagine that it was tough to whittle down the long list of accomplishments to 10 big wins. But we did. Green Ribbon is the first comprehensive and coordinated federal initiative to focus on the intersection of environment, health and education. In my mind, this program is the biggest thing to happen to the green schools movement, ever. To date, 33 states and the District of Columbia have signed on to participate. The Philadelphia School District and its community partners have made amazing progress in 2011 toward the greening of their 291 public schools. The district has a commitment that all new schools certify to LEED Silver and has been rolling out a plan to address the city’s existing schools. This year, Kensington Creative and Performing Arts High School – a Title 1 school where 90 percent of the students qualify for free or reduced lunch – made AYP for the first time after moving into the district’s first LEED Platinum facility. State Representatives Jim Decesare (R) and Mary Lou Marzian (D) led their colleagues in the Kentucky General Assembly to unanimously adopt a series of resolutions in support of green schools and have encouraged their legislator peers in other states to replicate their efforts to work across party lines. Last month, Jim and Mary Lou invited bipartisan group of decision makers from six states around the region to visit the nation’s first net-zero school and discover common ground on the topic of green schools. I was there to see that common ground wasn’t hard to find – who doesn’t support healthy, high-performing schools that educate healthy, high performing students? The Best of 2011 list comes on the heels of a third party, nationwide survey we commissioned earlier this year, which revealed that one third of Americans think that the majority of U.S. schools are in “poor shape.” Moreover, 90 percent of respondents indicated that the condition of our nation’s schools is no better than adequate. The same survey revealed that Americans see school modernization as a high-priority investment. And despite what Congress would have us believe, nearly three out of four Americans support federal investment in school building improvements focused on creating healthier learning environments, saving tax dollars or lowering carbon emissions. The U.S. Government Accountability Office reports that at least 25,000 U.S. schools are in need of extensive repairs and more than 10,000 of those schools have air that is unfit to breath. On the flip side, research has shown that, on average, green schools save $100,000 per year on operating costs. Greening our schools just makes sense and our hats go off to this year’s designees for their practical and forward thinking. At the Center for Green Schools, we view the greening of America’s schools as an imperative, and think that no elementary, middle, high school or higher education institution should be left behind. Whether it’s finding out if your state is participating in Green Ribbon, convincing your school board to implement sustainable practices or teaching your kids to turn off lights and recycle, join parents around the country who are getting engaged and working to transform the way we design, build, operate and maintain our schools. For more information on each of this year’s recipients, please visit: centerforgreenschools.org/bestof2011 or read the press release.